It hasn’t always been an easy road for New England’s oldest beer. Founded in 1890, Narragansett, a brewery with a long and storied past, actually closed its doors in 1983. But, in 2005, Rhode Island native and former President of Nantucket Nectars, Mark Hellendrung, along with several other investors, bought Narragansett Beer and reconnected with former Brewmaster Bill Anderson to re-create the original Lager recipe. From their flagship Lager to a great line of seasonals and rotating beer series, the brewery with a 126-year legacy is back and better than ever with a new brewery in the works that will bring production back to Rhode Island. D.L. Tell us about the new brewery “campus”. What will it entail and when will the project be finished? M.H. The project involves the revitalization of a 130,000 square foot manufacturing facility in Pawtucket, RI that once supplied metal works used to build Navy ships, among other things. The campus will be completed in phases and will ultimately house our brewery, a tasting room, gift shop, at least one restaurant, a bike shop and a beer education facility. The grand opening for brewing operations is slated for November of this year. D.L. Why was it so important for you to revive the brand in 2005? D.L. What does Narragansett’s motto, “Made on Honor. Sold on Merit.” mean to you? M.H. The motto was coined in 1909 and greeted visitors to the original brewery. “Made on Honor” speaks to a quality product, while “Sold on Merit” identifies the pride we take in selling it. D.L. Who coined the phrase, “Hi-Neighbor! 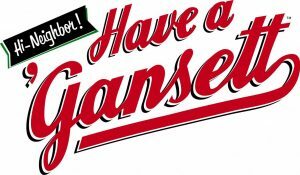 Have a ‘Gansett”? D.L. The famous Theodor Geisel (a.k.a. Dr. Seuss) created the Chief ‘Gansett image and other advertising in 1934. How would you compare your brand image now with the way he portrayed it back then? M.H. I think what people today appreciate about our brand image and design is that we’ve presented our heritage in a contemporary, interesting format. For example, every element of the design of our 16 oz. Lager can is from some moment in our 125-year history, but pieced back together to look timeless, while relevant at the same time. D.L. Many of your beers have stories behind them. Do you think the story behind the beer is as important as the way it tastes? M.H. I strongly believe that one of the unique strengths of craft brewers across the country is the ability to tell stories. And really, what is a beer without a story behind it? Drinking beer is a social experience, and sharing the stories behind the beers is a big part of that. D.L. Your Lovecraft Series of beers pays homage to the horror story author and Rhode Island native, H.P. Lovecraft. What inspired the series? M.H. The series came together from a few different directions. One of our ‘Gansett Girls, who is a librarian, brought up the idea. Sean Larkin, our Brewmaster, is a fan of Lovecraft and finally, H.P. and Narragansett were both celebrating their 125th year “birthdays” in 2015, when the series was created. Ultimately we felt the name and his creativity and inspiration were a great canvas for us to explore different styles of beer. D.L. What comes first in the creation of the beers in the series – the beer style or the particular work of Lovecraft? M.H. There really is no “this first and that next”. Just like there isn’t a beginning or an end. It’s a collaborative process, not just with Sean Larkin’s creativity or H.P.’s narratives, but also local artists who tell the story through the artwork on the can. D.L. 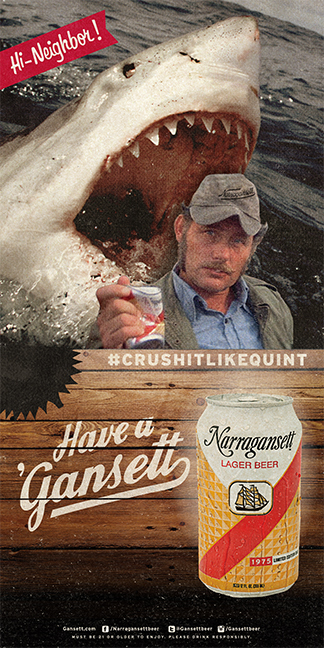 Each summer, coinciding with the Discovery Channel’s hit series Shark Week, Narragansett Lager “throwback cans” are released – the same cans that were “crushed by Quint” in the iconic movie, Jaws. Are you surprised by the amount of fans the movie still has? M.H. Every summer I’m blown away by the awareness and interest in Shark Week and Jaws, and by extension, people quoting movie lines and re-enacting the famous scene. Jaws was really the first summer blockbuster and it tapped into a fear that lives in most of us. D.L. Between the Lovecraft series and the tie-in to Jaws, horror is a recurrent Narragansett theme. Are you a fan of the genre? D.L. In the late ‘60s and early ‘70s Narragansett was a part of several big music festivals that included such acts as Led Zepplin and Crosby, Stills, Nash & Young. Have you ever thought of doing a music series of beer? M.H. Not so much a music series, although that’s a good idea. What we’ve done is work with a lot of bands, like Deer Tick, for local events like the WBRU Summer Concert Series. D.L. Your Mash-up Series that includes Del’s Shandy, Autocrat Coffee Milk Stout and Allie’s Donuts are made in collaboration with some of Rhode Island’s most famous companies. How did you choose which businesses to collaborate with? M.H. Our collaborations are not only about local icons, they also need to make sense for a beer. There are other local staples like hot wieners and clam cakes, for example, that we haven’t yet figured out how to translate to beer. D.L. The newest in the series, Hi-Neighbor! Have a Hefeweizen!, is made in collaboration with Bananagrams (a tile word game that originated in Rhode Island). This is your first collaboration with a company that doesn’t make food or beverages. What’s the story behind this one? M.H. Bananagrams was started 10 years ago in Pawtucket, RI, the home of our new brewery. So we have that local connection. And while there isn’t a direct food or beverage tie, we do see a real association between the social aspects of playing games and drinking beer. D.L. 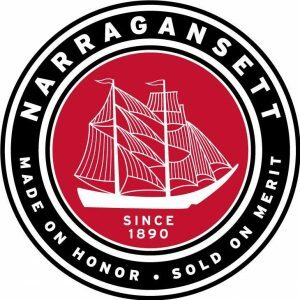 You are not releasing Narragansett Fest this year – why is that? M.H. We put Fest on pause until we get the new brewery up and running. Fans really love the beer, but it’s more of a specialty release. We’ll be able to create small batch beers more easily at the brewery in Pawtucket. D.L. There are several recipes made using beer on your website. Do you ever cook with beer? If so, what’s your specialty? M.H. My go-to is Beer Can Chicken made using our tall boy cans. It’s a meal that a novice like me can master. My wife, however, has a soup business and she makes a lot of stews in the winter with our heartier beers. They are delicious. D.L. What is your favorite Narragansett beer and food pairing? M.H. Lager and seafood, hands down. D.L. Who are the ‘Gansett Girls and what do they do? M.H. The ‘Gansett Girls are a nod to our past when Narragansett ran the, “Miss Hi-Neighbor!” contests. Today, they are the team that conducts bar promotions and tastings. D.L. What is the best part about owning a brewery? What is the most challenging? M.H. The best part is honestly the people I get to meet. I’m out on the road as often as I can be, talking to people about beer and life in general. I love hearing people’s stories. The most challenging part has to be the competition. Beer drinkers today have so many choices, and the big guys in the industry have so much more power than we do. But it’s that challenge that gets me up every morning to sell another case of ‘Gansett. D.L. If you had to drink one beer that was not one of yours for the rest of your life, what would it be and why? M.H. That’s a tough question, but it would have to be a refreshing lager. My buddy is a big surfer and I’ve been caught having a few of his Pacificos… that would have to be my choice. D.L. Can you tell us something about yourself that someone couldn’t find online? M.H. I get asked a lot of questions and tell a lot of stories about Narragansett Beer, which is a real passion of mine, but words can’t describe the importance of my wife and four daughters in my life.